With a Linux system, you can get a lot of information about a process from the /proc pseudo filesystem. Each process has an integer number to represent it; this is known as its Process ID, or PID. You see this in the output from the ps command and in many other places. A shell will report its own PID in the $$ variable, though you can also query your own /proc entry via /proc/self - the kernel will treat /proc/self as the calling program's PID. Be careful in testing this, though: If you try "ls -l /proc/self/exe", you will call ls, and the ls program will call /proc/self/exe, which gives you the name of the ls program itself, and not your shell's executable! Unfortunately, that is not very easy to read. The values are split by an ASCII "null" character (which is not a printable character), so all the variable names and their values get squashed in to each other. There are a few ways around this, but one of the neatest is to use the xargs command. This command has the convenient abiliy to be told which ASCII character to use as a seperator. So if you throw the content towards "xargs -0", then xargs will helpfully split the words at the otherwise unprintable "null" boundary. Now you get a nice, easy to read view of the environment of another process on the system. 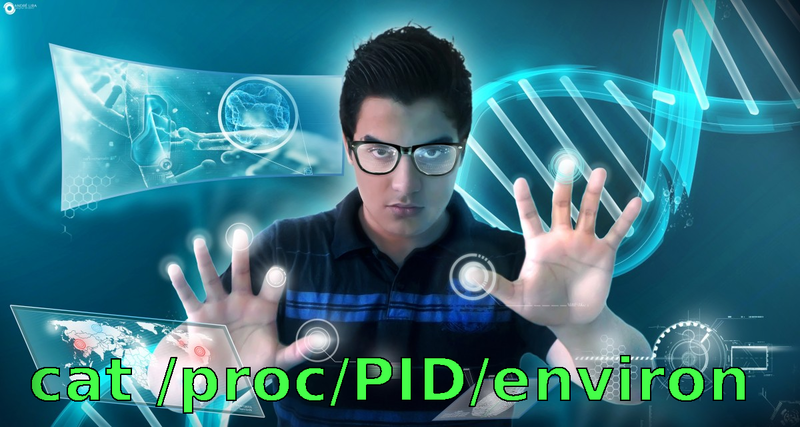 The /proc/PID/environ pseudo-file is created for you by the Kernel, but is not too easy to read, in the way it is presented. By using xargs -0 -n1, you can easily format it in a more easily readable format, and indeed this can be easily passed to another process.